Horrendus, such an iconic building..
Ironically, I am reading that they think it may have been caused by the renovation work that was being done. Interests:mongering, music, martial arts and movies i also love classic British tv comedies. As a child one of my favourite horror characters was Quasimodo from of course The Hunchback Of Notre-Dame, one of Frances greatest works of literature. I remember many years back going to see Charles Laughton in probably the best adaptation of the novel ,and Lon Chaney was the first to play him in the silent classic version. So although not as familiar with the building as I should , it still holds a place in my childhood. So sad this has happened to such an iconic building. Unbelievable. How can this happen nowadays ? I just can't help but wonder why a building of this significance and vulnerability doesn't have a 24x7 fire patrol inspecting it day and night. It's not like the Catholic Church would have trouble stumping up the funds. Lucky to visit a few years ago. Very sad to lose such history. Watching it on TV ... and I’m just feeling sad...one of the most iconic buildings in the world, it’s actually painful to watch. Yes I think I agree with you ! Just watched it on the news, looks like it started near some construction scaffolding. Already reported that the walls are intact and it will be rebuilt. Sloppy building practices on the renovation work? I think i read it was a $7m renovation project..be a bit more than that now. 850 years of history down the pan. There are some site workers having a sleepless night tonight. 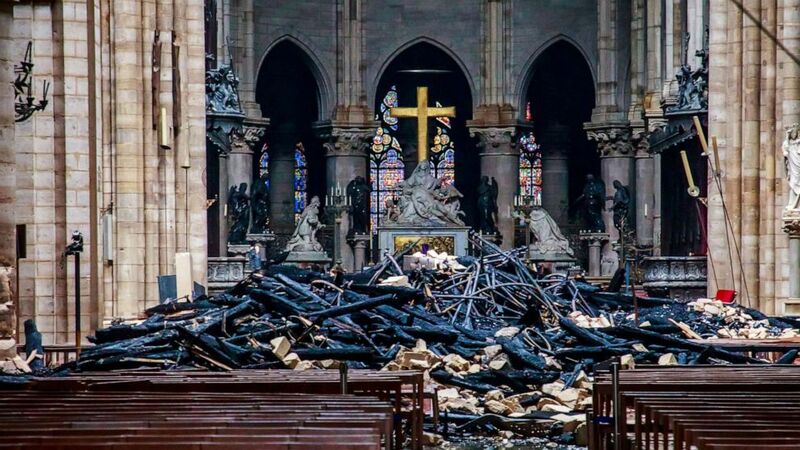 Have never been into the cathedral, have only seen it from outside, what a beautiful structure.....I do hope they rebuild it......I hear the damage didn't destroy the entire structure. Good video of the fire and destruction. Interests:Being a miserable so and so. I love unhappy hour bars. Reports coming out of Paris this morning suggests that the French Police are questioning the building contractor involved in the restoration works. I'd put a bet that it was a hot work accident for the renovations. The building, being ancient, has no code spec for fire tolerance, and most likely not retrofit with suppression. 700 years of history. It's a damn shame, but at least lots of corporations and rich people are stepping up pledging hundreds of millions of dollars in restoration donations. One French billionaire alone said he would pledge $300M euros to the cause. While you can't replace the history of the architecture and stained glass, the bones are still largely saved and they can replicate the spires and ornate glass. Hi. 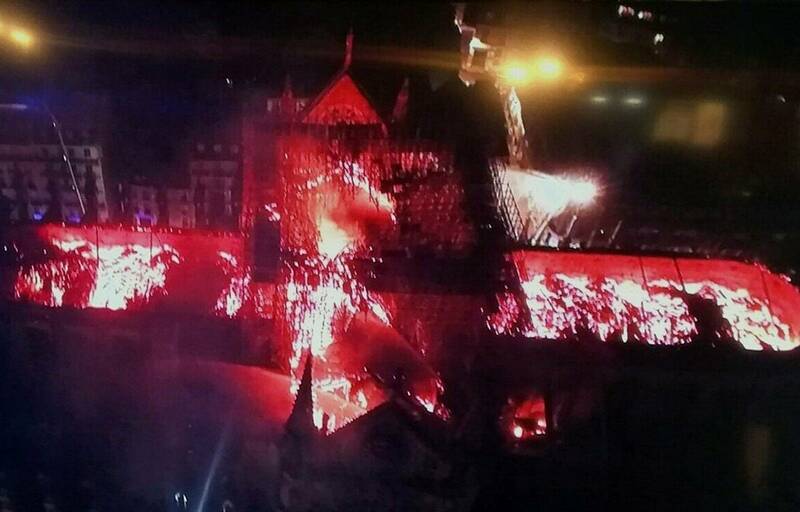 This fire on such an historical and symbolical monument is a tragedy, no doubt but now we (at least French people) have to be optimistic and to think about repairing it! There was big risk at some point to see the whole building collapse , but "thanks to God" (or rather thanks to the firemen work) the building still stand, with its towers and façade barely damaged and, despite a part of the vault who collapsed (below), there is good hope now that the building can be saved. 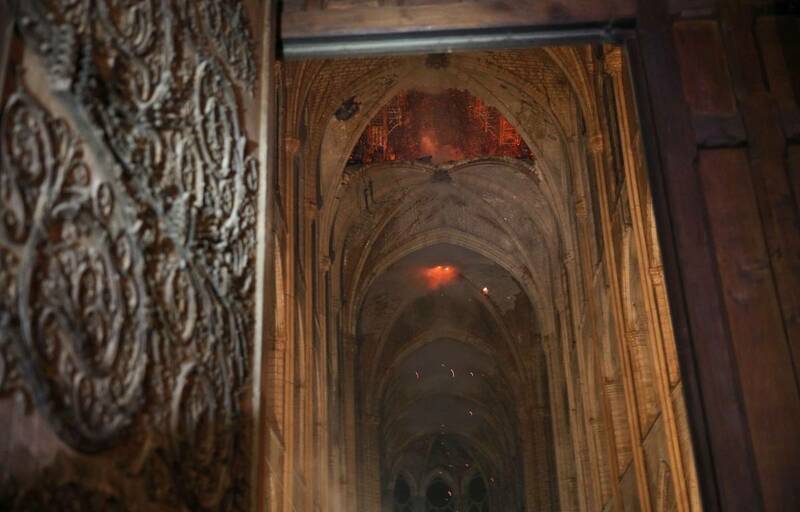 At this point it was too dangerous for firemen to fight the fire from the inside, but "Colossus" was there and played a big role in aviding that the inside of the cathedral burns. 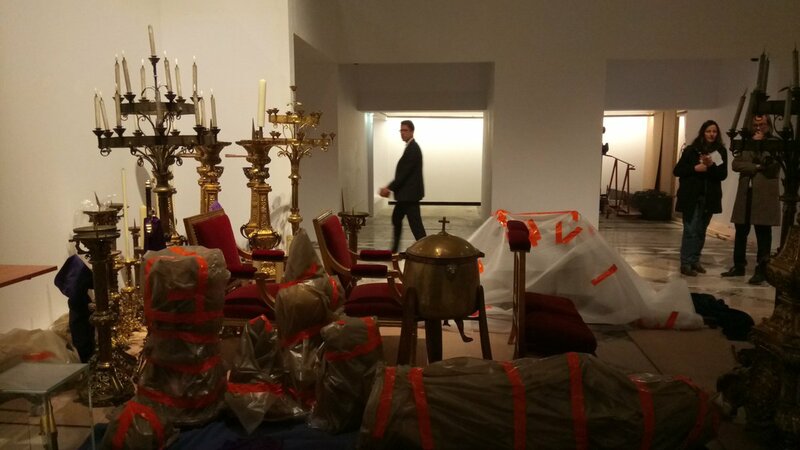 The work/renovation seems to be the source of the fire... but because of this renovation some of the biggest or most important pieces of art had been removed from the cathedral a few weeks ago, so undamaged. Also a human chain was quickly created by policemen and municipal agents on place, quickly helped by many civilians, to exit most (if not all) treasures who were in exposition. All major ones have been saved, and most (if not all?) other. 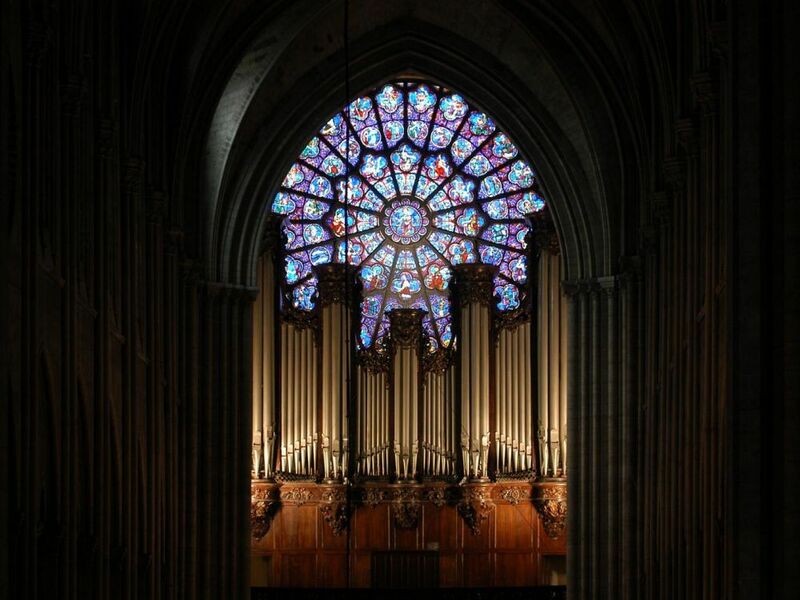 The organist said that famous big organ has not been damaged by the fire, but the huge quantity of water received may imply a renovation. "Nothing than we can't do" he said. The big rosette above the organ as - surprisingly - also resisted. The 2 richest French billionaires have quickly announce donations of 100 and 200 millions euros for the renovations and many companies also made smaller announces of donations. Thanks to them. Put simply because The Roof and spire were made of wood, and old dry wood already in need of restoration at that. Sad yes, and you are correct you would not expect it in this day and age but old dead wood and fire/sparks dont mix anywhere.